The thyroid gland is an endocrine organ found in the neck, it is responsible for regulating the body’s metabolic rate via hormones it produces. In this article, we will be looking at its anatomy, its cellular structure, its endocrine physiology and its clinical relevance. The thyroid gland is a ductless alveolar gland found in the anterior neck, just below the laryngeal prominence (Adam’s apple). It is roughly butterfly-shaped, with two lobes wrapping round the trachea and connected in the middle by an isthmus. The thyroid gland is not usually palpable. It is supplied by superior and inferior thyroid arteries, drained via superior, middle and inferior thyroid veins and has a rich lymphatic system. 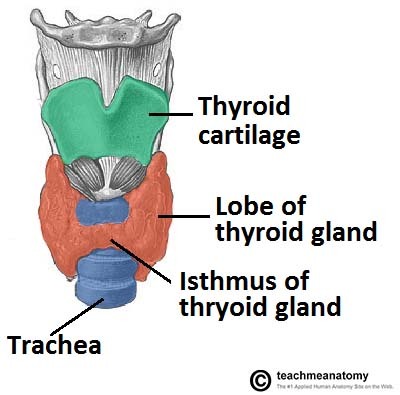 You can read more about the anatomy of the Thyroid gland here. The function of the Thyroid gland is to produce and store thyroid hormones. Thyroid epithelia form follicles filled with colloid – a protein-rich reservoir of the materials needed for thyroid hormone production. These follicles range in size from 0.02-0.3mm and the epithelium may be simple cuboidal or simple columnar. In the spaces between the follicles, parafollicular cells can be found. These cells secrete calcitonin, which is involved in the regulation of calcium metabolism in the body. This is achieved in a number of ways, such as increasing the size and number of mitochondria within cells, increasing Na-K pump activity and increasing the presence of β-adrenergic receptors in tissues such as cardiac muscle. There are six steps in the synthesis of thyroid hormone, and you can remember them using the mnemonic ATE ICE. Active transport of Iodide into the follicular cell via Sodium-Iodide Symporter (NIS). This is actually secondary active transport, and the sodium gradient driving it is maintained by a Sodium-Potassium ATPase. Thyroglobulin (Tg), a large protein rich in Tyrosine, is formed in follicular ribosomes and placed into secretory vesicles. Exocytosis of Thyroglobulin into follicle lumen, where it is stored as colloid. Thyroglobulin is the scaffold upon which thyroid hormone is synthesised. 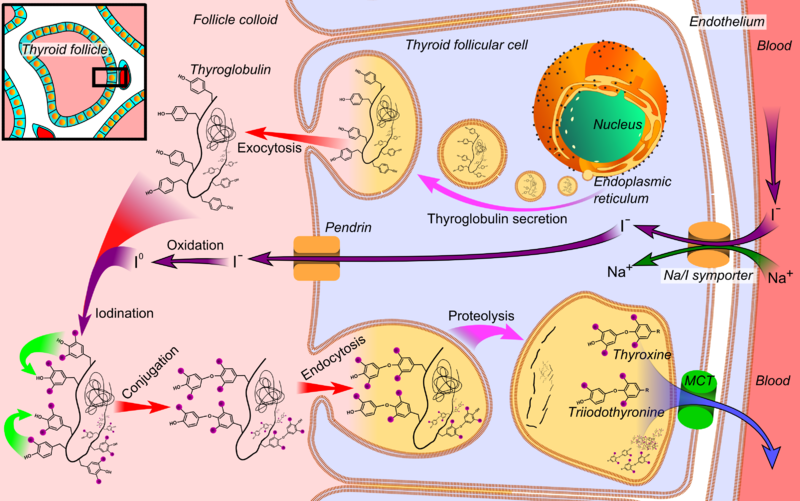 Iodination of the Thyroglobulin. Iodide is made reactive by the enzyme thyroid peroxidase. Iodide binds to the benzene ring on Tyrosine residues of Thyroglobulin. First formed is monoiodotyrosine (MIT) then diiodotyrosine (DIT). Coupling of MIT and DIT to give Triiodothyronine (T3) hormone and coupling of DIT and DIT to give Tetraiodothyronine (T4) hormone, also known as Thyroxine. Endocytosis of iodinated thyroglobulin back into the follicular cell. Thyroglobulin undergoes proteolysis in lysosomes to cleave the iodinated tyrosine residues from the larger protein. Free T3 or T4 is then released, and the Thyroglobulin scaffold is recycled. T3 and T4 are the active thyroid hormones. They are fat soluble and mostly carried by plasma proteins – Thyronine Binding Globulin and Albumin. While T3 is the more potent, it also has a shorter half-life due to its lower affinity for the binding proteins. Less than 1% of T3 and T4 is unbound free hormone. At the peripheries, T4 is deiodinated to the more active T3. T3 and T4 are deactivated by removing iodine. This happens in the liver and kidney. As T4 has a longer half-life it is used in the treatment of hypothyroidism over T3 as its plasma concentrations are easier to manage. Thyroid hormones are released as part of a hypothalamic-pituitary-thyroid axis. The Hypothalamus detects a low plasma concentration of thyroid hormone and releases Thyrotropin-Releasing Hormone (TRH) into the hypophyseal portal system. TRH binds to receptors found on thyrotrophic cells of the anterior pituitary gland, causing them to release Thyroid Stimulating Hormone (TSH) into the systemic circulation. TSH binds to TSH receptors on the basolateral membrane of thyroid follicular cells and induces the synthesis and release of thyroid hormone. 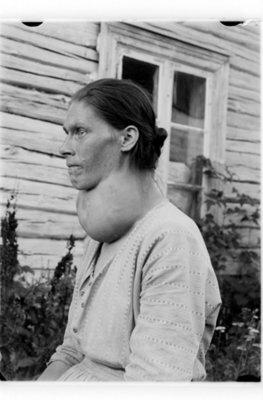 Goitre is the term for an enlarged thyroid gland. The organ swells up to a palpable and often visible size within the neck. This may be due to an over – or under active thyroid, iodine deficiency and in rare cases thyroid cancer. Hyperthyroidism is an overactive thyroid gland. One common cause of Hyperthyroidism is Grave’s Disease – an autoimmune condition where antibodies are produced that stimulate the TSH receptors on follicular cells. It affects roughly 1% of the population and is 10 times more common in women than in men. Patients may present with heat intolerance, weight loss, tachycardia, nervousness, increased sweating, exophthalmos and increased bowel movements. Hyperthyroidism can be treated with Carbimazole which inhibits iodine binding to thyroglobulin. Hypothyroidism is an underactive thyroid gland. One common cause of Hypothyroidism is Hashimoto’s Disease – an autoimmune condition where thyroid follicles are destroyed or antibodies are produced that block the TSH receptor on follicle cells. Like hyperthyroidism, roughly 1% of the population is affected with it being 10 times more common in women than in men. Patients can present with cold intolerance, weight gain, bradycardia, poor concentration, myxoedema, dry skin, some hair loss and constipation. Hypothyroidism can be treated with oral T4 tablets (100-200 µg/day), to replace the hormone that is not being produced by the body. Which of the following best describes the ARTERIAL supply to the Thyroid gland? Which ion in particular is key in the synthesis of thyroid hormone (TH)? Which of the following is a cause of goitre? Which of the following is considered a common symptom of Hashimoto's disease?